Welcome to the February 28, 2018 edition of ACM TechNews, providing timely information for IT professionals three times a week. Researchers at ETH Zurich in Switzerland have used machine learning to teach a computer to predict the outcomes of quantum experiments, which could be essential for testing future quantum computers. The new machine-learning software enables a computer to "learn" the quantum state of a complex physical system based on experimental observations and to predict the outcomes of hypothetical measurements. The researchers first showed the system hand-written samples, and it learned to replicate each letter, word, and sentence. The computer also calculated a probability distribution that expressed mathematically how often a letter is written in a certain way when it is preceded by some other letter. 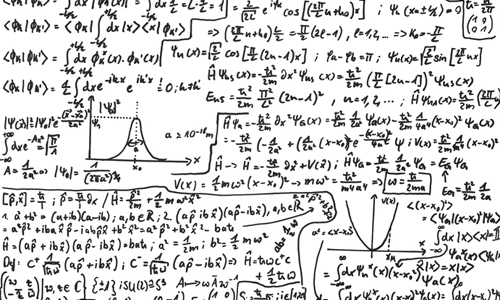 Although quantum physics is more complicated than a person's handwriting, the team says the principle for machine learning is the same. The standard technique requires about 1 million measurements to achieve the desired accuracy, but the new method realized this accuracy with a smaller number of measurements. The University of Southampton in the U.K. has activated Idris 5, a supercomputer with a peak performance of 1.3 petaflops. The 20,000-core system has already emerged as one of the most powerful machines in the world, entering the Top500 supercomputer list in November at number 251. "The University of Southampton has a long tradition in the use of computational techniques to generate new knowledge and insight," says Southampton's Oz Parchment. He notes in the past 10 years, Southampton has witnessed a 425-percent increase in the number of research projects using high-performance computing technologies. Parchment says the newest iteration of Idris is four times more powerful than its predecessor, and will be applied to analytics, bioinformatics, and artificial intelligence. Researchers at Michigan Technological University (MTU) have conducted a study examining what makes science, technology, engineering, and math (STEM) education integration practices work. The researchers found the greatest challenge teachers face is making explicit connections between STEM fields while balancing the need for context and student engagement. The team worked with nine middle-school science teachers to assess STEM integration in their classrooms, relying on reflective interviews with the teachers and classroom implementation of data. They found that after implementing integrated STEM instruction, the teachers were already considering ways in which to improve their practice. This highlights their motivation and dedication to incorporating these approaches in their classrooms, says MTU professor Emily Dare. The researchers emphasize many of the identified themes are not content-specific, meaning the successes and challenges could be used to identify general struggles that are common to educators who are integrating across STEM disciplines under new teaching standards. 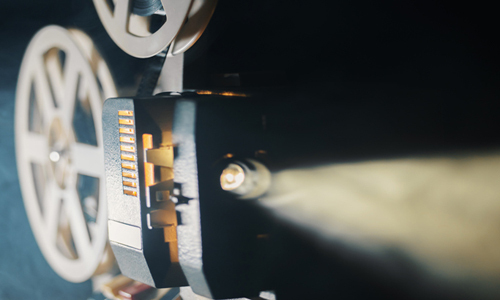 Researchers at Katholieke University Leuven in Belgium have developed an algorithm that creates videos from text snippets. The first stage of the process involves a "generator" neural network using text to produce a blurry image of the background with an unfocused blob where the main action occurs. The second stage derives a video from both this "gist" and the text, producing a short video. A second network functions as a "discriminator" during training by watching the generated video alongside a real video of the action described in the text, and is taught to pick the real one. This network's critical ability improves over time, with its feedback setting a higher standard for the generator network. The team trained the algorithm on 10 types of scenes, and a simple classification algorithm correctly guessed the intended action among six choices about 50 percent the time. There is a lack of developers or engineers who can build blockchain distributed ledgers, which is fostering a lucrative job market. In addition to earning big salaries, people experienced with specific blockchain iterations, such as Solidity and Hyperledger Composer, are in much higher demand. Most programmers pursuing a career as blockchain developers are usually versed in coding languages such as Java or Python. However, Deloitte Consulting's Eric Piscini notes, "More universities are starting curricula and the natural cycle to graduate enough students will produce good volumes in the next few years." Several accredited U.S. universities currently offer blockchain courses, such as the Massachusetts Institute of Technology, which has two courses on cryptocurrency engineering and design, and Stanford University, which supports a course that trains developers on how to create bitcoin-enabled applications. There also are specialty schools including Blockchain University and B9lab, which launched an online Certified Ethereum Developer Training program in 2016. Researchers at the Massachusetts Institute of Technology and Harvard University have developed the Veil system to improve private browsing by guaranteeing that any data the browser loads into memory remains encrypted until it is displayed on-screen. Instead of typing a URL into the browser's address bar, users go to the Veil website to enter it, and a "blinding server" transmits a version of the requested page that has been translated into the Veil format. Embedded within the page is code that renders the page data indecipherable until it passes through a decryption algorithm. The blinding servers also randomly insert meaningless code into every page they serve, changing the appearance of the underlying source file. Veil further augments security with an option in which the server opens the requested page itself and takes a picture of it; only the picture is sent to the Veil user, so no executable code winds up in the user's computer. The U.S. National Science Foundation (NSF) has announced three new Expeditions in Computing awards that collectively allocate $30 million to teams pursuing large-scale, potentially transformative research in computer and information science and engineering. The three $10-million awards emphasize the facilitation of game-changing innovations in real-time decision-making, quantum computing, and non-invasive biomedical imaging. A team at the University of California, Berkeley, will receive funding to create open source platforms, tools, and algorithms for Real-time, Intelligent, Secure, and Explainable (RISE) decisions. Meanwhile, researchers at the University of Chicago will use their NSF grant to enable and improve the efficiency of practical-scale quantum computing by leading a multi-institutional effort. 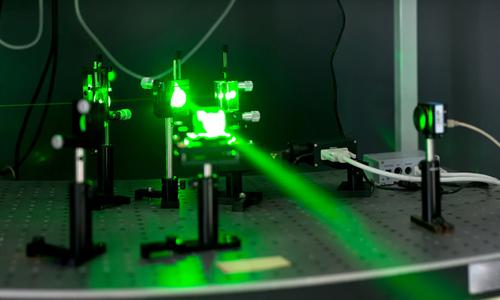 The third project, at Rice University, will concentrate on developing a computational imaging system called Computational Photo-Scatterography to deconstruct scattered light and enable non-invasive bio-imaging deep under the skin at cellular-level resolutions. The initiative could have a significant effect on medicine and healthcare delivery. Researchers at Saarland University in Germany have used deep-learning methods to develop an optimized steel microstructure classification process that outperforms conventional quality control procedures. "Machine-learning methods allow computers to recognize complex patterns very rapidly and to assign the geometry of the microstructures in microscope images," says Saarland professor Frank Muecklich. "They can learn the features of previously classified microstructures and compare these with recognized patterns." The researchers applied this approach to determine the microstructures of low-carbon steel at levels of accuracy and objectivity that were not previously possible. "When using our system for microstructural classification, we achieved a level of accuracy of around 93 percent," Muecklich notes. "With conventional methods, only about 50 percent of the material samples are correctly classified." Muecklich thinks these new techniques will not only help facilitate accurate and objective steel classifications, but also will be transferable to many other production processes and materials. Researchers at the University of Washington (UW) have developed a way to safely charge a smartphone wirelessly across a room using a narrow, near-infrared beam from a laser emitter. The engineers mounted a thin power cell to the back of the smartphone, and custom-designed safety features that included a metal heat sink to dissipate excess heat and a reflector-based mechanism to deactivate the laser in case someone attempts to move in the beam's path. "These features give our wireless charging system the robust safety standards needed to apply it to a variety of commercial and home settings," says UW professor Arka Majumdar. The smartphone emits high-frequency acoustic "chirps" so the emitter can detect when a user has set the phone on the charging surface. The team also notes the emitter can be tweaked to expand the charging beam's radius to up to 100 square centimeters from a distance of 12 meters. Researchers at Rice University say they have produced edible graphene, which could serve as the basis of an entirely new class of edible electronics. 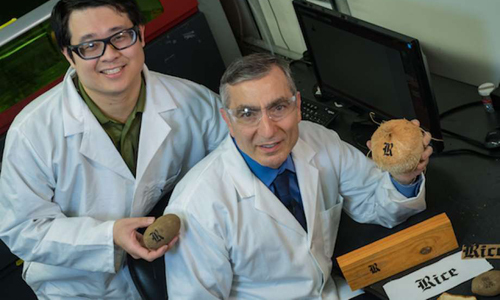 Rice chemists have found a way to print graphene onto common items such as bread or potatoes, as well as certain fabric and paper. Rice professor James Tour notes the material is not ink, but a process of "taking the material [i.e., food items, paper, clothes, etc.] itself and converting it into graphene." Tour thinks an early market for this newly-discovered method could be flexible wearable electronics. "Very often, we don't see the advantage of something until we make it available," he says. "Perhaps all food will have a tiny [radio-frequency identification] tag that gives you information about where it's been, how long it's been stored, its country and city of origin, and the path it took to get to your table." Researchers at the University of California, San Diego (UCSD) and the University of California, Berkeley have developed a method that dramatically improves the way computers simulate fur and the way light bounces within an animal's pelt. "Our model generates much more accurate simulations and is 10 times faster than the state of the art," notes UCSD professor Ravi Ramamoorthi. The researchers used a concept called subsurface scattering to quickly approximate how light bounces around fur fibers. The team used a neural network to apply the properties of subsurface scattering to fur fibers. The neural network only needed to be trained with one scene before being able to apply subsurface scattering to all the different scenes it was presented, resulting in simulations running 10 times faster than state-of-the-art systems. 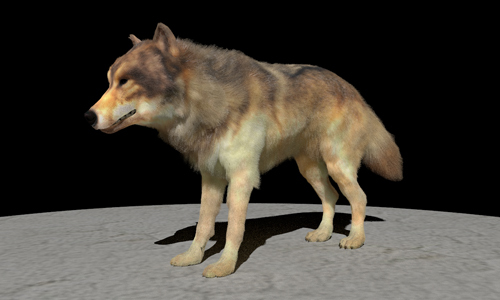 The resulting algorithm works as well for fur as it does for hair, and the appearance of human hair rendered with the technique is more realistic. Researchers at Cornell University are using augmented reality (AR) to advance three-dimensional (3D) printing and 3D modeling technologies, enabling designers to design in physical space while a robotic arm rapidly prints the work. The new in-situ fabrication technique was used in the team's Robotic Modeling Assistant (RoMA) system, in which a designer wears an AR headset with hand controllers. "The combination of AR and robot allows the designer to use the just-printed part to design their next features," says Cornell's Huaishu Peng. He notes the new interactive method lets the robot and the designer work together, with the robot knowing to print in the back of the object if the designer is working in the front, and automatically re-compute the changes being made in real time. In the future, the Cornell researchers believe this type of robotic arm can serve as an intelligent design assistant. In an interview, former Rutgers University professor Zhang Tong discusses his role and goals as executive director of Tencent Holding's artificial intelligence (AI) lab. Zhang says the lab is designed to use AI to help develop high-quality products, with emphasis on online-to-offline connectivity and the cloud. Of particular interest to Zhang is improving natural-language processing, and he also cites Tencent's Go-playing Jueyi AI program. "In China, we want to use [Jueyi] as a research bed to explore ideas and push forward [AI] technology," Zhang notes. "We are still working on [Jueyi] and it is far from solved at this point." Zhang also says a long-term project with much potential concentrates on using machine learning to study behavior in the virtual world, and eventually in the real world. "We are trying to align language with, for example, computer vision, speech, action, and so on," he says.